Marshmallow Update for ASUS ZenFone 2 - Some time ago Asus Zenfone 2 Laser ZE500KL and Zenfone Max ZC550KL already getting an update to Android 6.0 Marshmallow. And now, turn Zenfone 2 ZE551ML and ZE550ML could taste the sweetness of the marshmallow. 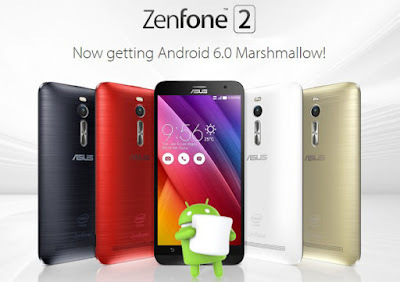 The Android Marshmallow software update for the ZenFone 2 is an over-the-air one and was pushed out by ASUS on June 13. Not only does the software update bring the Asus smartphone from Lollipop to Marshmallow, but the ZenFone 2 with model number ZE550ML and ZE551ML also benefits from the fact that the bloatware on the smartphone gets removed. Basically, over a Dozen apps will not be pre-loaded on the ZenFone 2 once users have updated their handset to the Android 6.0 Marshmallow OS.